Beautiful engraved specimen certificate from the InFerGene Company dated in 1988. This historic document was printed by United States Bank Note Company and has an ornate border around it with a vignette of the company name. This item has the printed signatures of the Company's President and Secretary and is over 20 years old. InFerGene was formed in 1985 to develop technology for genetic engineering of microbial strains used to make products for medical diagnostics, food processing, brewing and baking. In February 1991, InFerGene filed a voluntary proceeding under Chapter 11 of the United States Bankruptcy Code. 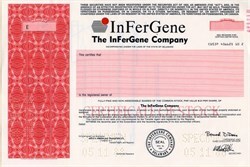 InFerGene no longer produces any products or has any material revenues. Under the new name Zaxis International Inc., it will serve as the holding company for the newly merged company.